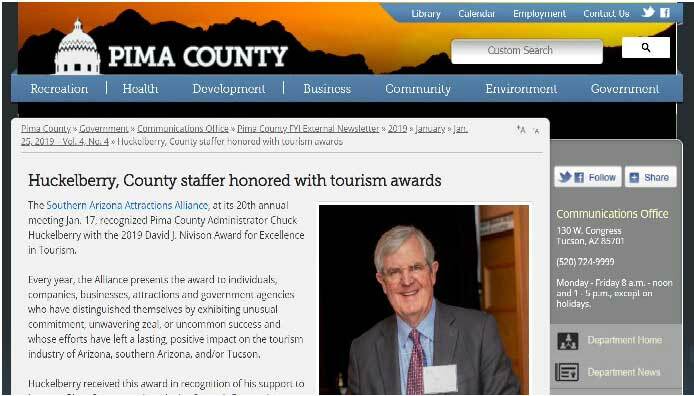 On January 17, the Southern Arizona Attractions Alliance, Pima County Administrator Chuck Huckelberry was awarded the 2019 David J. Nivison Award for Excellence in Tourism, according to an article in Pima County’s Weekly Newsletter posted on Facebook. 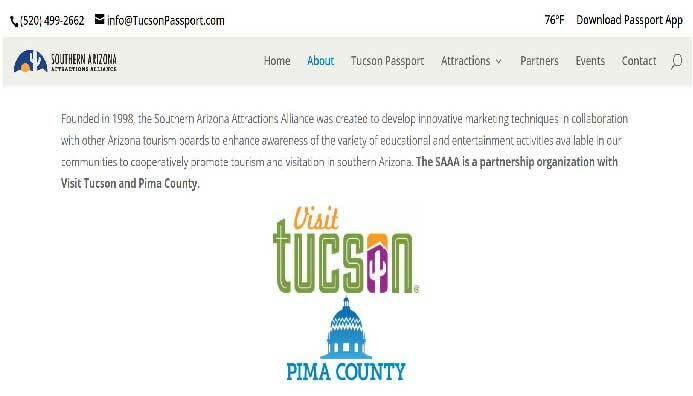 “Founded in 1998, the Southern Arizona Attractions Alliance was created to develop innovative marketing techniques in collaboration with other Arizona tourism boards to enhance awareness of the variety of educational and entertainment activities available in our communities to cooperatively promote tourism and visitation in southern Arizona. 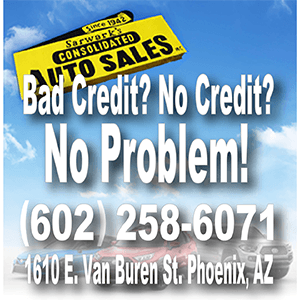 The SAAA is a partnership organization with Visit Tucson and Pima County,” according to the organization’s website. “In early November, an employee left the office “in tears” after Moulton allegedly told her to “shut the —- up,” according to a brief Nov. 3 human-resources report obtained by the Star through a public-records request. 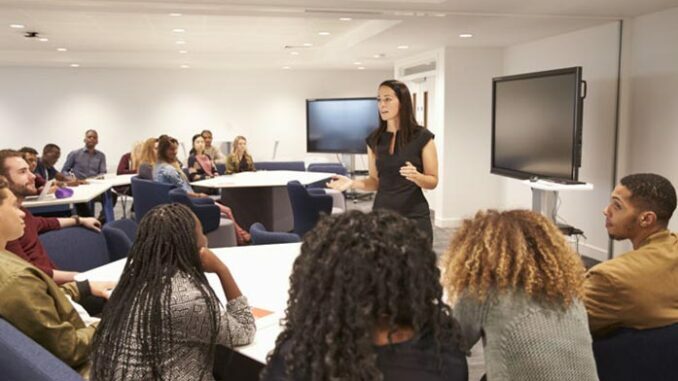 Similar incidents were alleged to have occurred previously, during which employees in the office would shut their doors, according to the report. An unnamed employee made the complaints to Chief Deputy County Administrator Jan Lesher, Moulton’s direct supervisor, who then relayed them to HR, as required by county policy, according to Lesher. Moulton would not comment when contacted by the Star. In response to questions about whether the investigation corroborated the allegations, fully or partially cleared Moulton or uncovered additional wrongdoing, county spokesman Mark Evans told the Star that “all we can say without violating the privacy rights of our employees or damaging the county’s extensive program to ensure a workplace free from inappropriate or wrongful behavior is that a complaint was made against Mr. Moulton and he was placed on paid leave while Human Resources investigated the claims. Moulton’s wife, Ellen, formerly Pima County’s Deputy Director of Finance and Risk Management, now serves as the County’s Director of Analytics and Data Governance, according to her LinkedIn profile. Strickland serves as Alliance’s marketing committee chair and creative director. Every year, the Alliance presents the award to individuals, companies, businesses, attractions and government agencies who have distinguished themselves by exhibiting unusual commitment, unwavering zeal, or uncommon success and whose efforts have left a lasting, positive impact on the tourism industry of Arizona, southern Arizona, and/or Tucson. 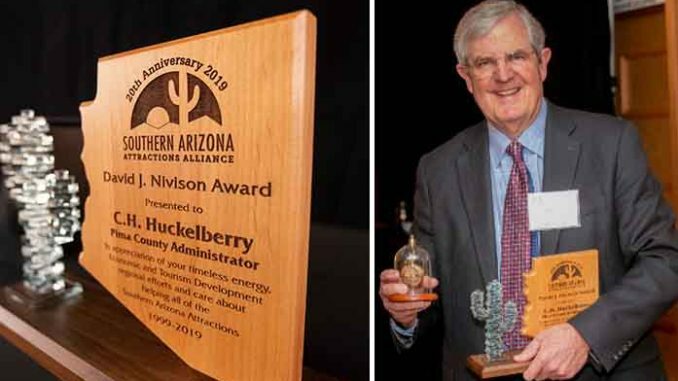 Huckelberry received this award in recognition of his support to improve Pima County tourism via the County’s Economic Development Plan, partnerships with leased properties and Southern Arizona Attractions, and through his efforts to renovate the Historic Pima County Courthouse and create a Regional Visitor Center. “Bob” Walkup, former mayor of Tucson, and Anne Maxon, Tucson Visitors Center; Robert “Bob” Shelton, former operator of Old Tucson; and Jack C. Camper, former president of the Tucson Metro Chamber of Commerce are past recipients of the award. Over the years, Visit Tucson had received a large portion of its funding from Pima County. On Monday, Aug. 20, the Pima County Board of Supervisors approved, in a 4-1 vote, $358,250 in funding for the Outside Agency Program, which provides financial support to non-profit community agencies that collaborate with the County to provide public services to constituents. Pima County Attractions and Tourism manages the Outside Agency Program to ensure the services provided compliment and expand those directly offered by the County. Funding levels will remain the same as in Fiscal Year 2017-2018. Recipients of the outside agency grants include the Ajo District Chamber of Commerce, the Children’s Museum of Tucson and Oro Valley, Tucson Meet Yourself, the Tucson Pima Arts Council, DM 50, Perimeter Bicycling, Tucson Botanical Gardens, and the Sonoran Desert Conference Center. The recipients will split the approved amount of $358,250. The Ajo Chamber, Oro Valley, Tucson Pima Arts Council, and the Sonoran Desert Conference Center are Alliance partners. Critics say that Huckelberry essentially controls the Alliance and as a result, the award is unusual. However, County insiders note that Huckelberry has touted awards he has received from “captured” organizations in the past, so the most recent award to himself is not surprising. Whatever the case may be, millions of taxpayer dollars have been spent on many of the partners, that have been less than successful. 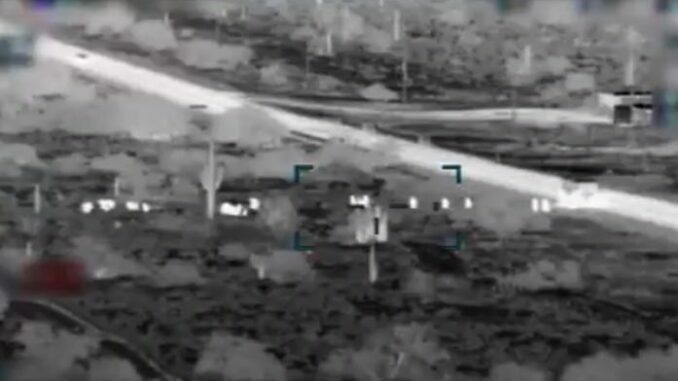 Those dollars combined with the Pima County Communications Department efforts to publicize Huckelberry’s “accomplishments” leave taxpayers wondering what they are getting for their money. We all know how important first impressions are when exposing someone to something new. A small group of us stood up against Proposition 463 and, fortunately, the Proposition failed. Pima county residents, for the second time in three years, said “NO more taxes” for roads when you are not using the 92 million we receive in HURF and VLT money to maintain our roads and setting proper priorities. Huckelberry also received a transportation award, which is truly amazing since our roads have been neglected for two decades. This is one more example of Huckelberry and the Pima County Board of Supervisor majority thumbing its nose and you and spending your tax dollars on whatever they want instead of what you need, want and demand – starting with maintained roads. It is time for Huckelberry and the Board of Supervisors majority to ride into the sunset on Huckelberry Loop – which, I might add, is in pristine condition compared to our failed roads! And if they don’t, they don’t get paid! Thanks ADI for another article exposing the blatant cronyism that has been going on in this County for decades!! They are all in bed together. We cannot find a street out of our neighborhood without potholes, deep crevices in the blacktop (4″ and more) but Huckster gets an award for encouraging tourism! 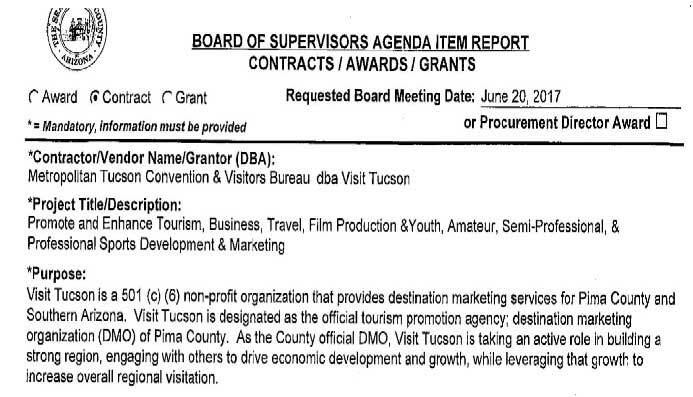 Is that in part that he gave road money to the airlines to keep them using Tucson Intl Airport? I am further disgusted by this article. But thank you for publishing the information. What an amazing feat! Thanks Komrade Chuck! What a great dictator you are! so much money by not fixing the roads! Huckleberry and the rest of our local political fraudsters are using our taxes to create their own little world for their own economic benefit and the voters keep re-electing them. It is way past time for some real political leadership. He’s going to need a bigger office to display all these awards! More tax money that would have/should have gone for the roads! Next we’ll have to pay for a gold plated bicycle! I hope he doesn’t read this cause that probably gave him another idea! So full of himself. Inflated ego. Inflated salary. He is so full of crap you couldn’t fill all the pot holes on Tucson roads with it. Jerk #1.